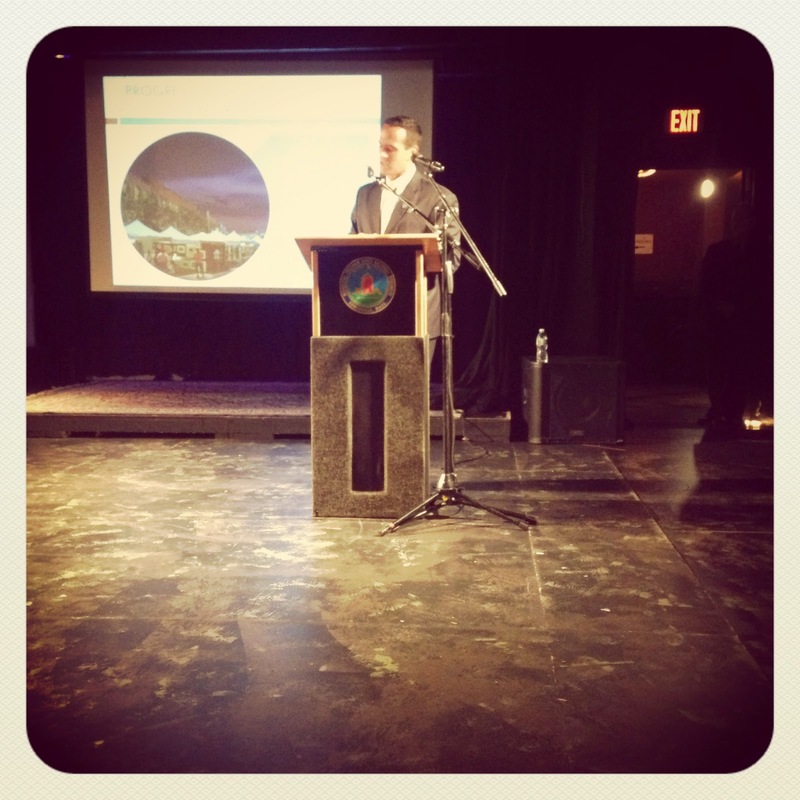 Mayor Joe Curtatone addressed a room full of business owners and residents in his May 20th Business Town Hall Meeting. This is his ninth time accepting the Chamber of Commerce's invitation to speak. During his presentation titled, "Progress, Growth, Service," Curtatone pointed out ways the City's has invested in improving its economic performance, but also cited areas where the City could improve. Whether it was improving the East Somerville streetscape or rolling out a new design for Davis Square, Curtatone highlighted the rapidly-changing physical setup of Somerville as one of the biggest changes the City is undergoing to attract new businesses and patrons. One future project noted was the grounding of the McCarthy Overpass and replacing it with a boulevard featuring bike lanes and wider sidewalks. East Somerville also features wider sidewalks giving restaurants an opportunity to expand services to outside seating and traffic upgrades in an effort to make the business district easier to navigate by foot or bicycle. East Somerville and Davis Square are joined by Brickbottom, Innerbelt and Central Broadway as focus areas for rejuvenation according to the presentation. Davis Square is close to 100% design completion with renderings scheduled to be rolled out this summer. Brickbottom and Innerbelt are both slated for infrastructure upgrades while community feedback sessions are already underway for Central Broadway linking Foss Park to Magoun Square. Major physical changes have made Somerville one of the top-ten most bikeable and walkable cities...honors that have led to economic stability, Curtatone insisted. Although Somerville has made great strides in economic performance, there is still work to be done and Mayor Curtatone was not shy about pointing out areas where the City falls can certainly improve to be on the same pace as businesses. For example, the Inspectional Services Department has been a main priority, not only for the Mayor, but for the full Board of Aldermen, as well. The addition of an Inspectional Coordinator, more convenient hours, dedicated inspectors for dumpsters and rodents, and an upgraded front office have been good steps forward for the department. The average response time for ISD has dropped from 30 days to just under a week, according to the presentation. The Mayor did, however, note that the department still has a long way to go to keep up with demand. On May 21st, the City really stepped up their game with the launch of Citizen Serve where users can purchase permits and schedule inspections. Although not all permits or licenses are available at this time, the website alleviates a huge burden for those looking to do construction work in the City. The information compiled by the website will be available to inspectors, via iPad, out in the field. The Mayor announced the launching at the Business Town Meeting. The administration is not only committed to making Somerville physically attractive for the current and potential business community, but also making it safer too. Somerville's crime stats have showed significant decreases since 2011. Curtatone credited smaller substations placed in the City for faster response times and more efficient policing that have resulted in a 1/3 cut in crime since 2008. At the conclusion of the Mayor's presentation, a question and answer period brought up various topics on the minds of the business community. Here are some bullet points the Mayor's response to these questions. Appeal of previous court decision in the City's favor is being appealed. City has made it clear that they want to work with the property owner to have a "food source" in the location.